When you're recovering from a C-section delivery or natural delivery, you want a bassinet that keeps your baby close and your movements to a bare minimum. Many experts recommend keeping the baby in the same room. Since C-section pregnancies make up over 30% of all deliveries, it’s no surprise that millions of women find modern innovative bassinets to be a blessing. Halo is the manufacturer you want to rely on for revolutionary nursing gear that hospitals swear by so you know that it’ll ensure an environment in which your body will not be put at risk. Don’t make the mistake most mothers make which includes using a traditional bassinet before understanding all the available bassinet options out there. By not taking the time to figure out the best bassinet option, it could make it harder for your body to bounce back from after giving birth, especially if you will be or you already had a C-section delivery. If you decide to breastfeed your baby, using a traditional bassinet sometimes will hinder your ability to check up on your child in a timely fashion. You can avoid letting your child endure a moment of hunger when you take advantage of what a Halo Premiere Series Bassinet has to offer. Keep reading for a detailed review of Halo Swivel Sleeper Premiere Series Bassinet. Do you want the ultimate in convenience and safety? Need extra help soothing your baby when it starts crying at a random time of the night? You should invest in the innovative designs of bassinets coming from 21st-century bassinet manufacturers. With a JPMA certification, the Halo Swivel Sleeper Bassinest is one of the best on the market. In regards to Halo Bassinest Series Bassinet, the manufacturer labels it as a revolutionary device that was inspired by Halo’s bassinet model initially designed for hospital use. This means you can purchase Halo nursing gear for in-home use while taking advantage of the fact that it is identical to the gear that doctors rely on to equip their hospitals. The 360-degree swivel sleeper provides the ultimate convenience. You can quietly rotate the bassinet and it will not disturb the baby. The Swivel Sleeper bassinet has an adjustable height gives you the ability to sleep close to your baby while providing your baby with a safe separate sleep area next to your bed. The base easily tucks under the bed, making the bassinet ideal for small spaces. With maximum breathability, the mesh sides safely ensure comfort and convenience for both the mother and baby. It is rare to find a bassinet that can provide unlimited visibility and side walls that lower and returns automatically. The walls can also be locked so you can imagine how surprised mothers are when they hear about the features that come with Halo Bassinest Swivel Sleeper Premiere Series Bassinet. The bassinet is easily cleaned with a damp cloth. The fitted sheet is machine washable, making clean up easy for all new parents. Buyers rave about the convenience that results from incorporating a Halo Bassinest Swivel Sleeper Series Bassinet to be a part of your go-to nursery gear since it is a new and improved take on the traditional bassinet. 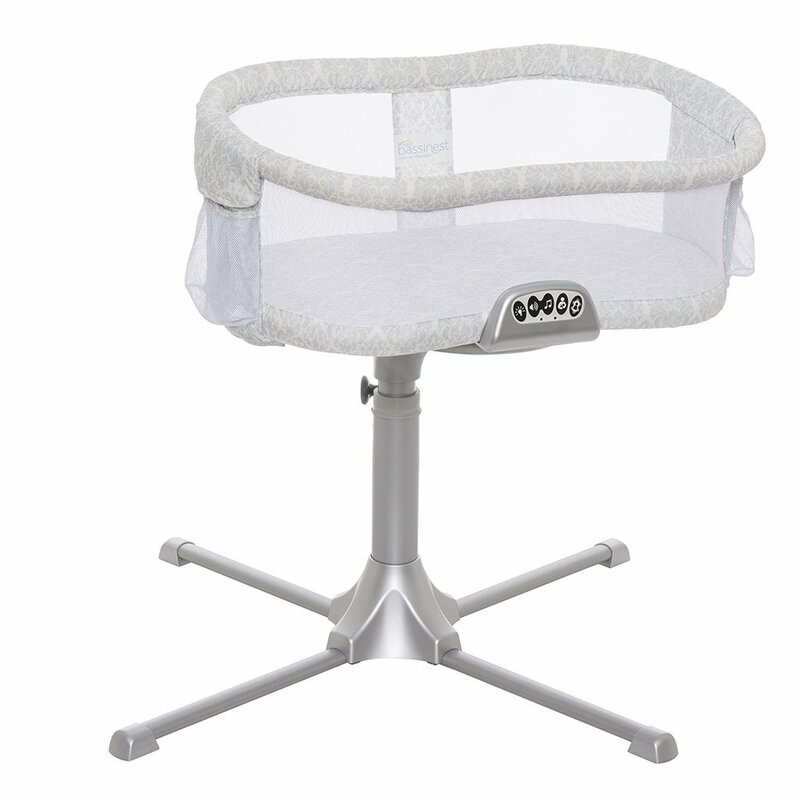 Halo Bassinest Premiere Series Bassinet comes with rotating and swiveling capabilities. Keep in mind that you can also lower the mesh sides of the bassinet, so sitting up is no longer a requirement to be able to reach your baby. You can also view your baby with any obstruction of view. The new music and vibration module are built with an option of three lullabies, three soothing sounds and a new back-to-bed reminder. All with thirty-minute auto-shut off. A tiny nightlight is included. There are also two storage pockets for baby essentials. There are three styles available on the market. The Luna, Riverstone and Rose Leaf. Both the Luna and Riverstone are neutral while Rose Leaf is pink in tone. All are modern and chic. Based on positive buyer reviews, you should expect your life to become easier when you rely on a Halo Bassinest Swivel Sleeper Series Bassinet for soothing your baby. 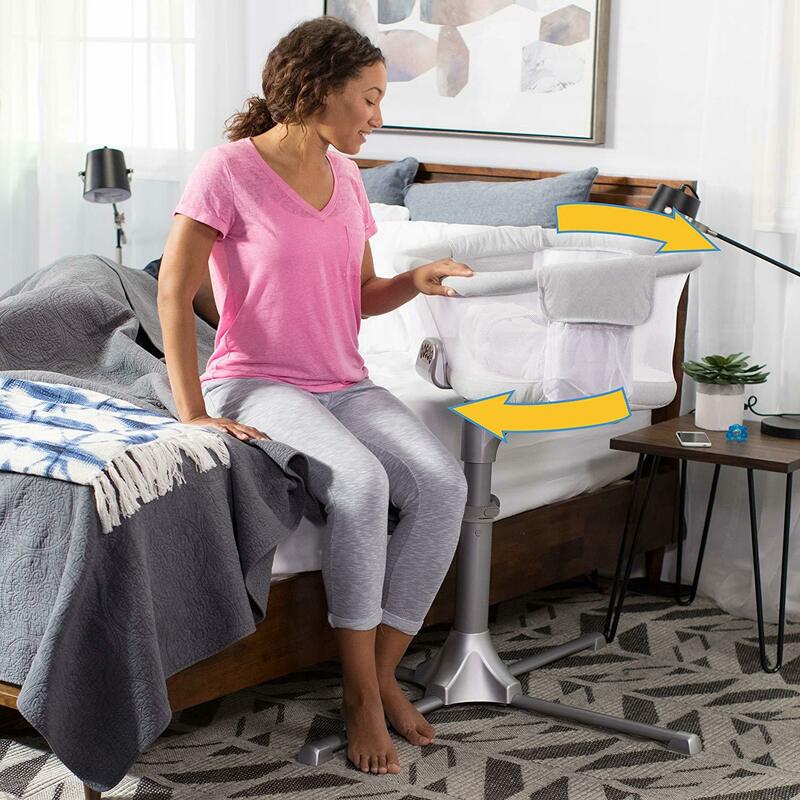 Halo Bassinest Premiere Series Bassinet removes the need for you to continually get out of bed since your baby will be situated right next to you with eye level visibility. Thankfully, women who go through with a Cesarean delivery now have a bassinet option that will cater to their needs. The music/vibration module will come in handy during those fussy moments too. The Premiere bassinet has multiple options – three lullabies, three soothing sounds and even a thirty-minute back to bed reminder. A nightlight is also included which comes in handy during late night diaper changes. All have a thirty-minute shutoff which runs on 3 AA batteries. The batteries are not included. After taking a look at all the online vendors that sell the Halo Bassinest Swivel Sleeper Premiere Series Bassinet, a majority of buyers tend to lean towards Amazon for their purchasing needs. Even though Amazon doesn’t offer any discounts in regards to the overall cost of the Halo Bassinest Swivel Sleeper Premiere Series Bassinet, the online retailer does offer yearly protection plans that function as additional insurance on top of the manufacturer's warranty that comes with the product in the first place. 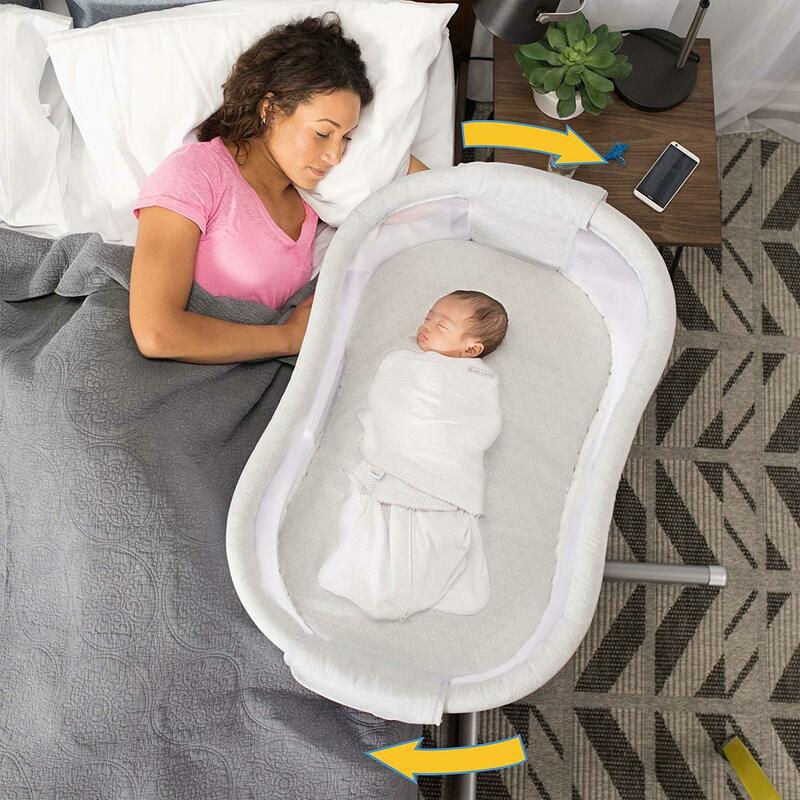 The price may seem steep for a baby product you’ll use for a limited time frame, but Halo has created a new improved bassinet that provides you with a variety of soothing features for your convenience which is priceless. This is the perfect baby shower gift that will be in the spotlight. The Halo Bassinest is on most expecting mother’s registry. The new mom will genuinely appreciate the fact that you bought her the ultimate bassinet available, the Halo Bassinest Swivel Sleeper Premiere Series Bassinet. Keep in mind that the price tag on this bassinet may seem pretty steep, but the perks of the Swivel Sleeper bassinet outshines its competitors. I would highly recommend buying Halo Bassinest Swivel Sleeper Premiere Series Bassinet, whether it's for yourself or a friend, it'll prove to come in handy during a pivotal time in a baby's life.